LEWISTON - Clifford Hebert, 95, of Lewiston died Sunday morning Jan. 13, 2019, at Montello Manor. LEWISTON – Clifford Hebert, 95, of Lewiston died Sunday morning Jan. 13, 2019, at Montello Manor. Born in Guerette, Maine, Feb. 13, 1923, he was the son of Yvonne (Lagasse) and Adelard Hebert. On Dec. 12, 1942, Clifford married Cecile (Couturier) of Frenchville, Maine. In 1949, they moved to the Lewiston/Auburn area where they raised their four children. Cliff enjoyed attending church, carpentry, yard work, bowling, playing cards and bingo, and visiting with his 18 younger brothers and sisters. Cecile, the love of his life, died Dec. 3, 2002. They were married for 60 years. 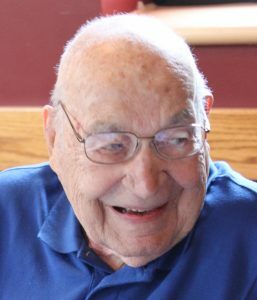 Known as a hard worker from the time he was a “cookie” in the northern Maine lumber camps, Cliff worked at Federal Distributors in Lewiston from 1950 to his retirement in 1988. Many admired Cliff because he showed how to lead by example. He was well known in the community not only because of his career at Federal Distributors, but also his passion for bowling in leagues and tournaments, and his faithful church attendance at St. Joseph’s and Holy Family. Cliff cherished these memories until the end of his life. Cliff is survived by his four children: William and his wife, Monita, of Bolton Conn.; Dolores Zake and her husband, Carson, of Pasedena, Md. ; Roland and his wife, Dilcia, of District Heights, Md. ; and Donald and his wife, Mary, of Kennebunk, Maine. Cliff had eight grandchildren who adored him: Norman Hebert and his wife, Brenda, of Glastonbury, Conn., Michael Hebert and his wife, Susan, of Glastonbury, Conn., Lynn Hebert of Bolton, Conn., Sally Blickenstaff and her husband, Ed, of Pasedena, Md., Anthony Hebert of Omaha, Neb., Angela Hebert of Ormand Beach, Fla., Scott Hebert of Phoenixville, Pa., and Brian Hebert of Bend, Ore. He was predeceased by two grandchildren, Jimmy and Tracy Pepin. He also had seven great-grandchildren, including Christopher Hebert and his wife, Brittany, of Colchester, Conn., Mark Hebert of West Hartford, Conn., Kaitlyn Hebert of Glastonbury, Conn., Kristin Hebert of Glastonbury, Conn., Nicole Blickenstaff of Pasadena, Md., Bella Blickenstaff of Pasadena, Md., and Tyler Hebert of Omaha, Neb. Cliff had one great-great-grandchild, Brooks Hebert of Colchester, Conn.
Cliff was the oldest and the anchor of his large family. He is survived by 16 of his siblings including sisters Verna Levesque of Longwood, Fla., Mildred Rioux of Auburn, Albertine Poisson and her husband, Rosaire, of Lewiston, Cecile Levesque of Lewiston, Lorena Sedgley Lewiston, Madeline Bowie of East Hartford, Conn., Evelyn Jean of Lewiston, Odelie Lessard of Auburn, Lucille Gilbert and husband, Richard, of Poland, Marcella Hebert of Lewiston, Bernadette Posnick of Lewiston, Janet Baron of Lewiston, and Sandra Dumais of Auburn. Surviving brothers include Roger and his wife, Theresa, of Millinocket, Reginald and his wife, Claudette, of Cross Lake, and Marcel and wife, Rita, of Auburn. Cliff was predeceased by two brothers, Robert Hebert and Ronald Hebert (survived by his wife, Loretta) and seven brothers-in-law: Roland Levesque, Burt Rioux, Raymond Levesque, Gordon Sedgley, Norman Jean, Donald Lessard and Devon Baron. He is survived by many generations of nieces and nephews. Funeral services celebrating Clifford’s life will be held on Wednesday January 23, at 11 a.m., at Holy Family Church. Committal prayers to follow at St. Peter’s Cemetery. Family and friends are invited to visit on Tuesday Jan. 22nd from 3-6PM at the Pinette Dillingham & Lynch Funeral Home 305 Alfred Plourde Parkway Lewiston, Maine.